Changes to Keeneland’s September yearling sale aside, it’s hard to get a good angle on the yearling market as the first week of the auction went into the books. Has it been a good sale to this point, or a bad one? 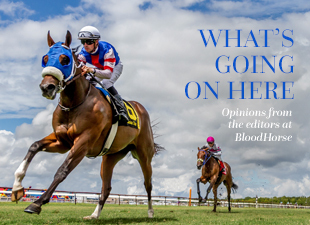 Where’s the bloodstock market headed? It depends on whom you ask. The “super select” sessions of the first two evenings delivered some much-needed electricity to the sale, and most participants were pleased with the expanded Book Two format that spread 1,300 top-line yearlings over four days. However, by the fourth day of Book Two, the crowd around the sale arena and by the walking ring seemed thinner than in years past. Several we surveyed saw the sale as doing pretty well…but they were quick to point out they were not ordering champagne to celebrate—perhaps a Budweiser. • The bottom line average and median have held fairly steady with last year’s…and most any business sector that is flat with last year’s figures can be considered fairly healthy these days. • John Ferguson, Sheikh Mohammed’s bloodstock agent, is not the leading buyer during the sale for the first time in memory. Last year he spent more than $13 million during the select sessions; this year he spent $2.7 million through Book Two. With that kind of scale-back from a major player at an already-thin top end and for the market not to be reeling from the effects is a good sign. • And whenever pundits begin to say the market has hit the skids, a new face or two pop up. This year it is in the form of Benjamin Leon Jr., buyer of the $4.2 million sale-topper (and $1.2 million sale-topper at Fasig-Tipton Saratoga). Another relative newcomer to the market, Kaleem Shah, spent $1.2 million for two horses during the first two books. George Bolton, former co-owner of two-time Horse of the Year Curlin, returned to buy a seven-figure colt on day three. However, some see the sale as being worse than last year’s market meltdown. One seller in Book Two expressed the fact there is some serious downward pressure on prices. Good-looking foals out of his best mares that once could have brought upward of $300,000 were bringing less…a lot less. One can place the blame on not enough buyers and mixed signals from the actions of buyers on the ground. Many horses were getting eight or nine scopes from vets—generally a good sign that several potential buyers were “on” the horse—then those horses would bring prices far below the sale’s average in the ring. As an example, the above-mentioned consignor had one colt out of a stakes-winning Storm Cat mare tied to a $100,000 stud fee. Not feeling overly confident with the market, he set a low-ball reserve at $49,000. We watched as the colt sold for $50,000. A top prospect in his consignment just became a bargain-bin loss leader. Even before the horse went through the ring, he noted he’d be gun-shy about high-end stud fees for 2011. We have the feeling he’s not alone. Buyers may have come to the sale looking for bargains and found a few, but not as many as they had hoped. Regardless of the economy, the right horse always commands attention. Those $200,000-$300,000 “right” horses are hard to acquire. On the other hand, should one be an “iffy” prospect, there is little or no action. When we asked about the remaining days of the sale, we received a few blank stares and a lot of winces from both the buyer and seller camps. One hope looking toward the future is that this may be the last year of “overproduction” in the yearling marketplace. Last year’s foal crop was down around 10%, and as per its announcement during the sale, The Jockey Club estimates in its Live Foal Report that the 2010 foal crop (yearlings of next year) will be down an additional 14.2%. While stallion owners wince at the continued trend in fewer breedings, basic Economics 101 says the reduction of product should increase demand, which hopefully will reduce the number of winces this time a year from now.